Researchers at the Nanoscale Transport Physics Laboratory from the School of Physics at the University of the Witwatersrand have found a technique to improve carbon superlattices for quantum electronic device applications. 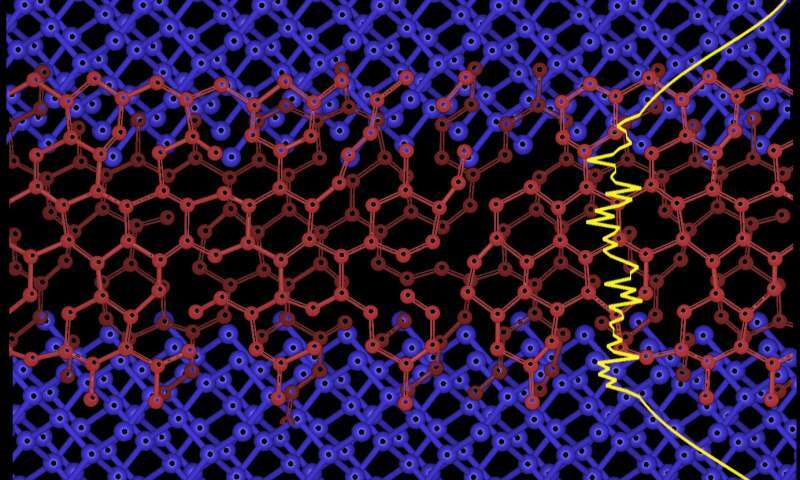 Superlattices are made up of alternating layers of very thin semiconductors, just a few nanometers thick. These layers are so thin that the physics of these devices is governed by quantum mechanics, where electrons behave like waves. In a paradigm shift from conventional electronic devices, exploiting the quantum properties of superlattices holds the promise of developing new technologies. The group, headed by Professor Somnath Bhattacharyya has been working for the past 10 years on developing carbon-based nano-electronic devices. "Carbon is the future in the electronics field and it soon will be challenging many other semiconductors, including silicon," says Bhattacharyya. The physics of carbon superlattices is more complex than that of crystalline superlattices (such as gallium arsenide), since the material is amorphous and carbon atoms tend to form chains and networks. The Wits group, in association with researchers at the University of Surrey in the UK, has developed a detailed theoretical approach to understand the experimental data obtained from carbon devices. The paper has been published in Scientific Reports on 19 October. "This work provides an understanding of the fundamental quantum properties of carbon superlattices, which we can now use to design quantum devices for specific applications," says lead author, Wits PhD student, Ross McIntosh. "Our work provides strong impetus for future studies of the high-frequency electronic and optoelectronic properties of carbon superlattices". 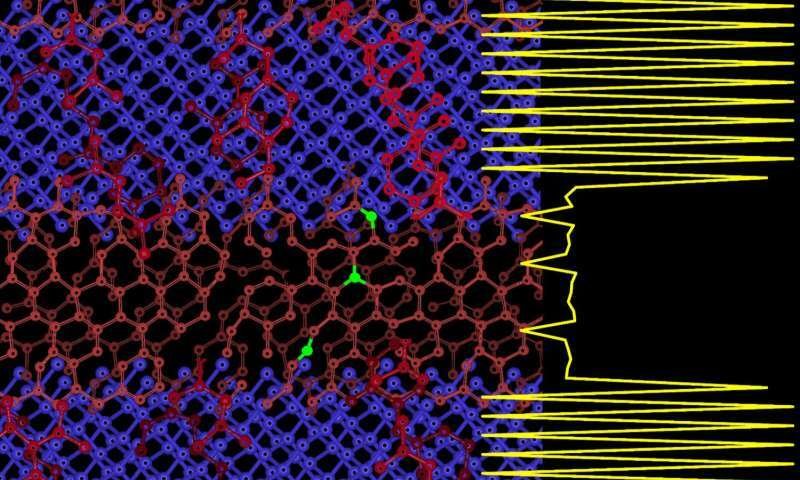 Through their work, the group reported one of the first theoretical models that can explain the fundamental electronic transport properties in disordered carbon superlattices. Bhattacharyya started looking at the use of carbon for semiconductor applications almost 10 years ago, before he joined Wits University, when he and co-authors from the University of Surrey developed and demonstrated negative differential resistance and excellent high-frequency properties of a quantum device made up of amorphous carbon layers. This work was published in Nature Materials in 2006. McIntosh undertook the opportunity at honours level to measure the electrical properties of carbon superlattice devices. Now, as a PhD student and having worked extensively with theoretician Dr. Mikhail V. Katkov, he has extended the theoretical framework and developed a technique to calculate the transport properties of these devices. Bhattacharyya believes this work will have immense importance in developing Carbon-based high-frequency devices. "It will open not only fundamental studies in Carbon materials, but it will also have industrial applications in the electronic and optoelectronic device sector," he says. Superlattices are currently used as state of the art high frequency oscillators and amplifiers and are beginning to find use in optoelectronics as detectors and emitters in the terahertz regime. While the high frequency electrical and optoelectronic properties of conventional semiconductors are limited by the dopants used to modify their electronic properties, the properties of superlattices can be tuned over a much wider range to create devices which operate in regimes where conventional devices cannot. Superlattice electronic devices can operate at higher frequencies and optoelectronic devices can operate at lower frequencies than their conventional counterparts. The lack of terahertz emitters and detectors has resulted in a gap in that region of the electromagnetic spectrum (known as the "terahertz gap"), which is a significant limitation, as many biological molecules are active in this regime. This also limits terahertz radio astronomy. Amorphous Carbon devices are extremely strong, can operate at high voltages and can be developed in most laboratories in the world, without sophisticated nano-fabrication facilities. New Carbon-based devices could find application in biology, space technology, science infrastructure such as the Square Kilometre Array (SKA) telescope in South Africa, and new microwave detectors. "What was lacking earlier was an understanding of device modelling. If we have a model, we can improve the device quality, and that is what we now have," says Bhattacharyya. Are carbon nanotubes the next in-line for the manufacture of wearable electronics?